How does it make you feel when someone asks about yours? More and more donors are asking. 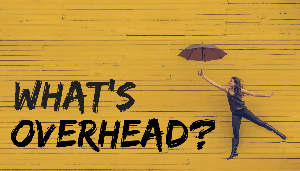 So you need to know what overhead is, why it matters and why it can be good for your nonprofit. I like Peter Drury's metaphor  that overhead is like cholesterol. There's good cholesterol and bad cholesterol. Just because your number is high, that doesn't necessarily mean it's a bad thing. In fact, three watchdogs in the nonprofit sector have come together to create OverheadMyth.com. The Better Business Bureau, Guidestar and Charity Navigator want to dispel the misconception that overhead is bad. Overhead is just another name for your organization's general operating expenses. In the grant writing world, you may hear funders refer to your overhead or general operating expenses as "indirect expenses." Indirect expenses are all the general costs associated with running your organization. Things like rent and utilities as well as your executive and administrative staff expenses. Direct expenses, in contrast, are what you spend "directly" on the things you need to deliver your programs and services. Things like program staff salaries, program-specific supplies or equipment and travel. WHY DO I NEED TO KNOW OUR INDIRECT EXPENSES? Some donors  including foundations  will ask you how much you're spending on direct services (which is a backwards way of asking how much you spend on overhead). I recently completed a grant application that not only asked for the nonprofit's indirect expense ratio  it asked for an explanation, if the percentage was greater than 25%. WHAT'S A GOOD INDIRECT EXPENSE RATIO? In its Wise Giving Guidelines, the Better Business Bureau recommends that an organization spend at least 65% of its expenses on program activity. This means your indirect expense ratio, or your overhead, should be less than 35%. Charity Navigator found that 9 out of 10 charities spend at least 65% on direct expenses, and that 7 out of 10 spend at least 75% on their programs and services. Go to your last 990, and look for the section called Statement of Functional Expenses. Column A is Total Expenses. Column D is Fundraising Expenses. Add Column C (Administrative Expenses) to Column D (Fundraising Expenses). The sum is your total indirect expenses. Divide your total indirect expenses by column A (Total Expenses) to get your indirect expense ratio %. IS A LOWER OVERHEAD RATIO BETTER? Not necessarily. There's a saying that "You have to spend money to make money." "We've all been taught that the bake sale with 5% overhead is morally superior to the professional fundraising enterprise with 40% overhead. Who cares if the bake sale only has 5% overhead, if it's tiny? What if the bake sale only netted $71 dollars for charity because it made no investment in its scale? What if the professional fundraising enterprise netted $71 million dollars because it did? Now which pie would we prefer?" The new school of thinking is that overhead isn't a bad thing, especially when those expenses are being used for growth. The Overhead Mythbusters say that overhead isn't the only way to measure a nonprofit's performance. And it's certainly not the best way to measure your organization's impact. In his TED Talk, Dan Pallotta goes on to say that the nonprofits that work so hard to keep their overhead low are, actually, doing themselves a disservice. Because they're not spending money on the things they need for their organization to grow and thrive. How about you? Maybe you need new technology. Maybe your staff needs professional development. Maybe you need to hire dedicated fundraising staff. These investments in your organization and your people? All good expenses. And all indirect expenses. When you think about it that way, overhead definitely isn't a bad thing. Need help creating a plan to reach your fundraising goals? Let Laura help. Laura Rhodes is a Certified Fund Raising Executive, Certified Grant Writer, fundraising consultant, speaker, and trainer. She's helped nonprofit organizations raise millions of dollars from foundations and individual donors. When she's not writing grants, appeal letters or case statements, she enjoys teaching staff and board members how to raise more money for the causes they love.